rav1e GUI is a Graphical User Interface for the rav1e encoder software. It allows you to encode your video files to the AV1 video format easily and fast. The input file is first converted to a user-specified length .y4m files. The audio from the video is extracted as WAV. The .y4m segment files are encoded in parallel to .ivf using rav1e. This significantly speeds up the encoding process. The .ivf files are concatenated into one final .ivf file. The concatenated .ivf and .opus files are merged into a .webm or .mkv file, which is the output file. The tool uses ffmpeg, rav1e and opusenc to perform the above steps. Click here to see a list and download links for previous releases. Fixed bug when 2-pass was checked or unchecked. By default, Low Latency will not be checked. If the software is closed while encoding is in progress, it can continue the next time it is started. Checks that an input and output files are set and that a temporary folder has been specified. 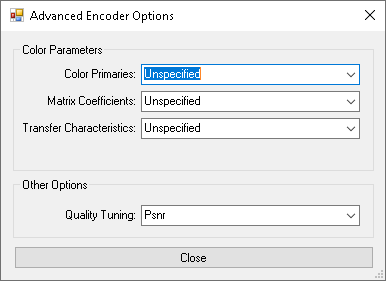 Added Color Primaries settings in the Advanced Encoder Options window. Can now specify Minimum and Maximum keyframe interval. Can now save video in the Matroska container. Users can now specify piece seconds. Added Keyframe Interval and Low Latency options as supported by the newer rav1e builds. Click here to download standalone rav1e.exe builds.